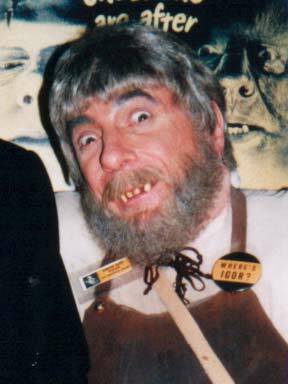 The 2002 Monster Bash featured Guests of Honor Chris Costello (Lou Costello's daughter), Ben Chapman (Creature From the Black Lagoon), Cortlandt Hull (Werewolf of London descendant), Caroline Munro (Hammer and James Bond film actress), Bob Burns (1950s Sci-Fi/Our favorite Ape Man! 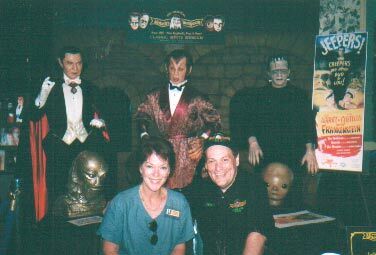 ), Tom Savini, Butch Patrick (Eddie Munster) and many more. Another wonderful year at the Days Inn Conference Center in Butler, PA (north of Pittsburgh). 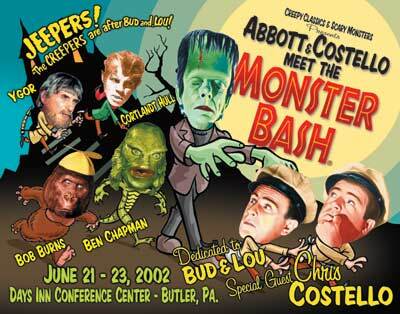 We dedicated the Bash to Abbott & Costello meeting our favorite monsters in film. 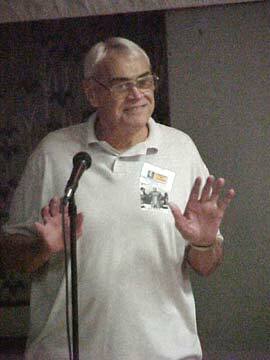 Chris Costello gave a knock-out talk, as did Bob Burns and Cortlandt Hull. Plus, Dave Hagan of Monster-Mania sponsored and did the Q&A for the lovely Caroline Munro. 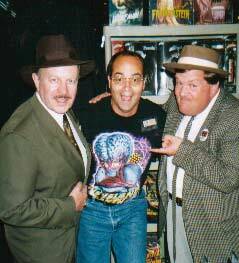 How about the Abbott and Costello impersonators that were walking around easing into classic routines -- and their interaction with Michael "Dracula" Thomas was priceless! 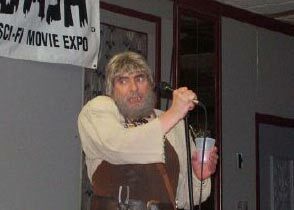 And, of course, dear old Ygor (direct from the sulphur pits) roaming the halls and intoducing films. Thank you attendees, dealers and staff! 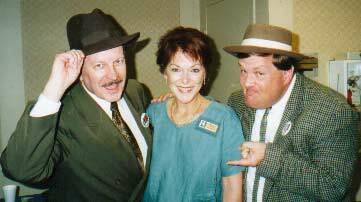 Oh, we also through out hundreds of "Bats and Balls" to the audience after Bud and Lou impersonator's did "Who's On First?" baseball routine. The balls were plastic and the bats were....well, rubber vampire bats! 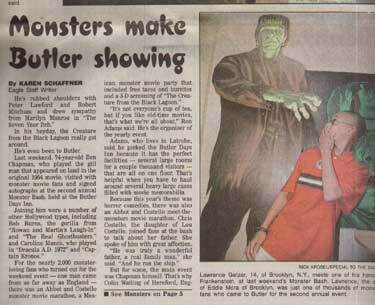 Front page of the Butler Eagle newspaper for Monster Bash 2002! 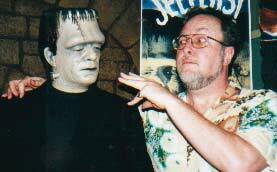 Bob Burns ever smiling enthusiasm over the genre represents the Monster Bash philosophy to a tee! More coverage from the Butler Eagle newspaper! 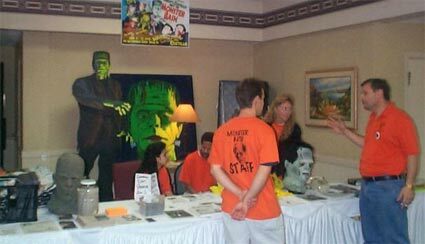 An attendee attempts to revive Dracula near Monster Bash registration! 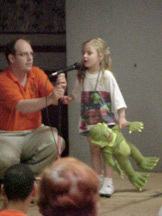 Paisley Adams reprises her 2000 introduction to her favorite monster - the Creature from the Black Lagoon (Guest of Honor Ben Chapman). 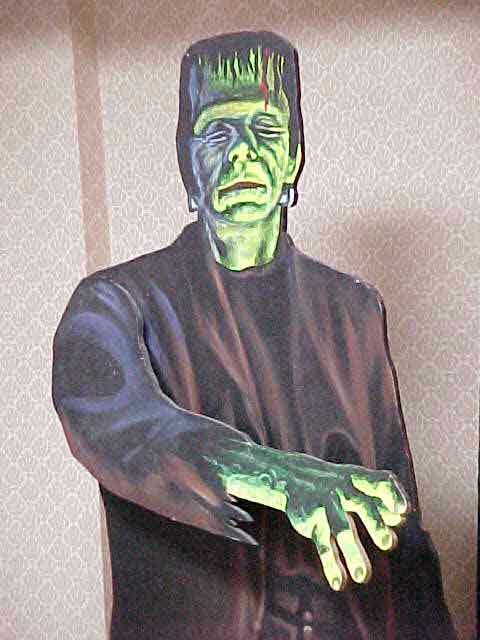 Big Frankie (over 7 feet tall) greets Bash attendees at registration. 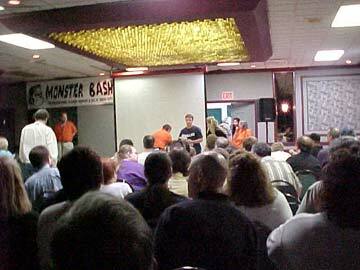 The Monster Bash event room. 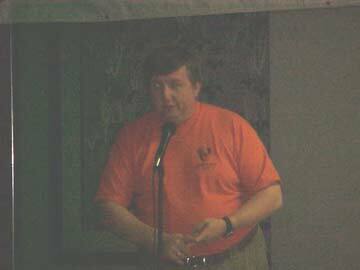 I believe staffers in orange shirts are handing out free tacos and burritos on Friday Mexican Monster night in this photo! 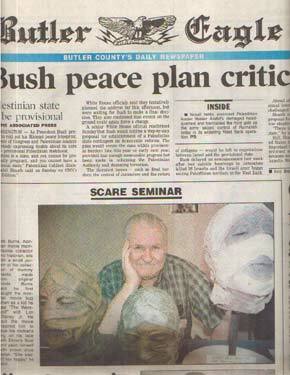 Editor/Publisher of horror-wood.com and Bash staffer, Joe Meadows dicusses the CREATURE FROM THE BLACK lAGOON and the 3-D process in which the film was shot. 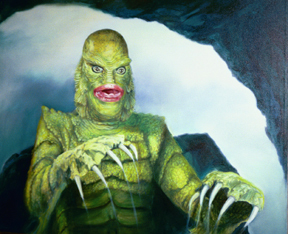 Ben Chapman, the man in the Creature suit for all the land sequences in 1954's CREATURE FROM THE BLACK LAGOON. 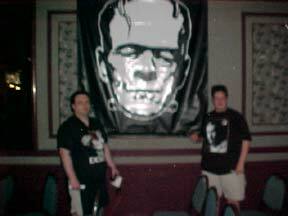 Two attendees flank a Frankenstein banner at Monster Bash. 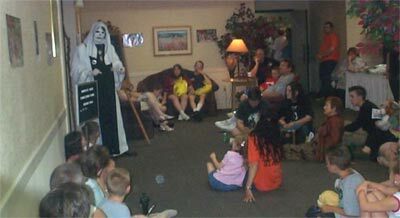 Carpathian, the ghosty storyteller had a huge crowd of kids on Saturday afternoon in the hotel lobby as he wove tales of terror! 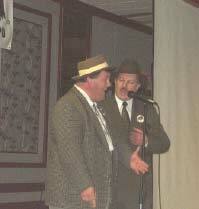 The great Bud and Lou impersonators (Bill Riley and Joe Ziegler) at Bash doing "Who's On First?" just before Chris Costello spoke! 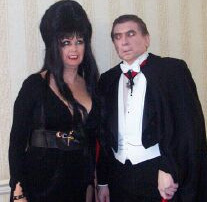 Elvira and Drac made it to Bash with you (Christine and Michael Thomas)! Ygor entertaining the crowd with snappy patter and crowd pleasin' anecdotes! 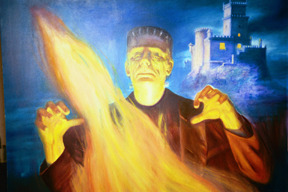 Awesome painting by Lorraine Bush at Monster Bash 2002! Another painting by Lorraine Bush! Caroline Munro with Monster Bash attendees! Caroline Munro and fan from Canada at Bash 2002! 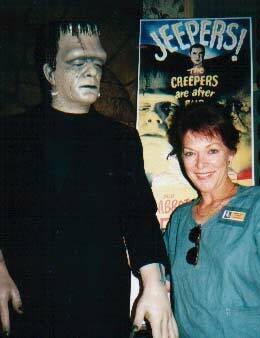 Ursula and Ron Adams with Tom Savini's 7 foot RIGHT ON Frankenstein monster! Stunning detail....just incredible. 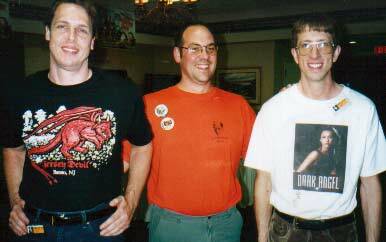 Chris Costello with Cortlandt Hull and figures looming from The Witches Dungeon. 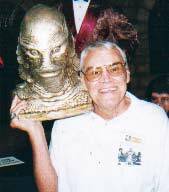 Bob and Kathy Burns....Bob is holding the original headpiece from Glenn Strange's montser in ABBOTT AND COSTELLO MEET FRANKENSTEIN! 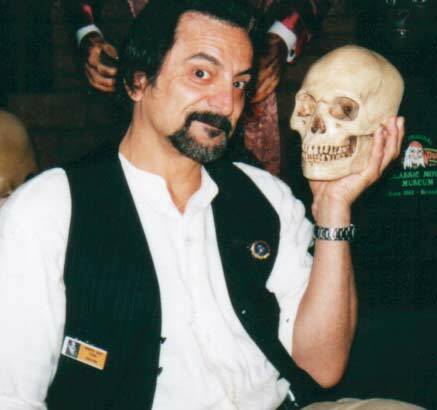 Tom Savini with a skull he sculpted! But......who's skull, yours? 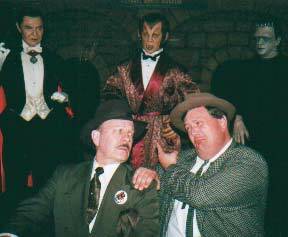 Bill Riley and Joe Ziegler as Abbott and Costello meeting the Monster Bash! 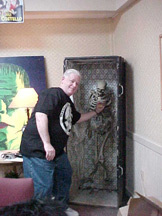 Chris Costello and a "Strange" friend! 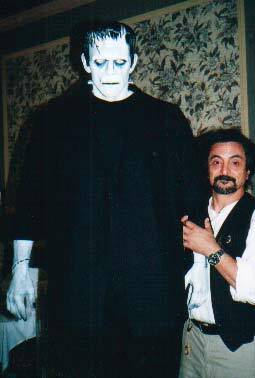 Tom Savini and his seven foot masterpiece! 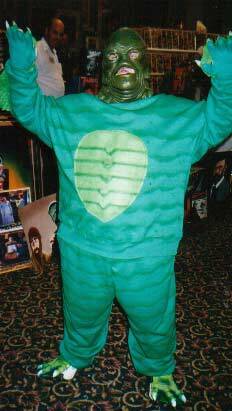 Some people have a monkey on their back....some people have a gill man on their back. 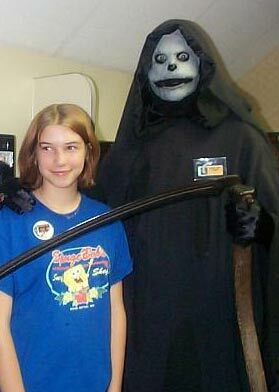 Ben Chapman with his old friend. 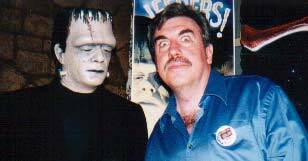 Big Frankie and Universal make-up man John Goodwin at Bash 2002! "Yes......master." Richard Valley, editor and publisher of Scarlet Street magazine puts the whammy on Frankie! 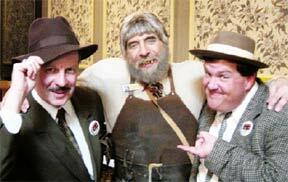 Abbott and Costello Meet Ygor! You get all kinds attending the Bash! Caroline Munro with VIP attendee Karl Spisak! Bash 3-D showing...look at all the 3-D glasses! 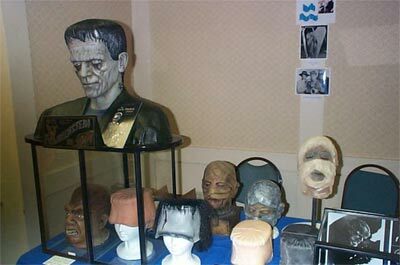 Some of the prop's and rare ghoulish goodie on Bob Burns' table! 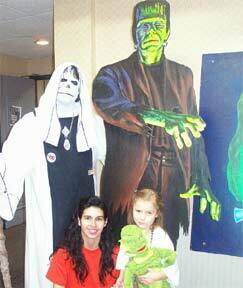 Ghostly storytelling in the Bash lobby for kids of all ages by the ever-present Carpathian! 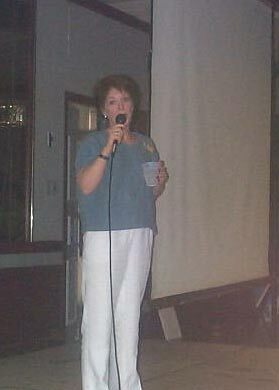 Chris Costello gives a moving talk and home movie presentation about her dad, Lou Costello. Some of the front desk crew of the Monster Bash! Chris Costello and the boys ! 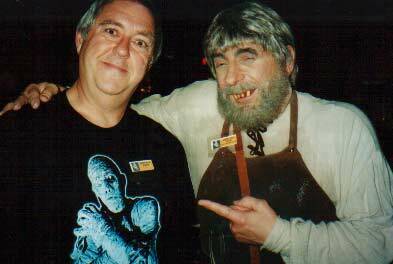 Vendor Kevin and "blacksmith" Ygor at the Monster Bash! Lugosi lovers Kristen and Father Mike, Uncle Larry, Joe Shepherd, Ron Adams and Bob Pellegrino. The boys with Bash vendor Uncle Larry! A pair of brothers viit with Mike Adams at the Bash! 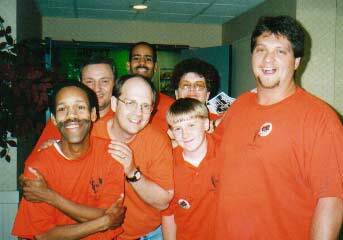 Some of the Monster Bash staff: Eddie, Bob, Geoffrey, Ron, Barb, Travis and Joe! 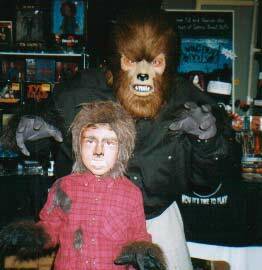 A pair of (howwwllll) werewolves at the Monster Bash! 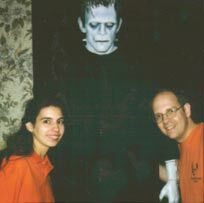 Monster Bash crew Shawn, Lee Ann and "40" with Uncle Larry! 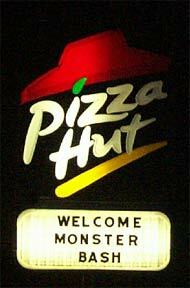 Look what crawled out of the black lagoon for Monster Bash! 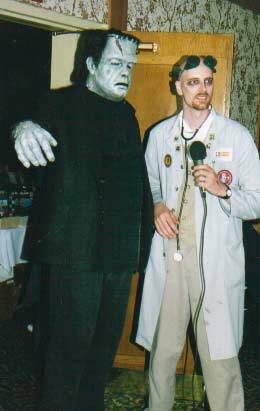 Frankenstein's monster hangs tight with TV Horror Host Dr. Gangrene at the Bash! 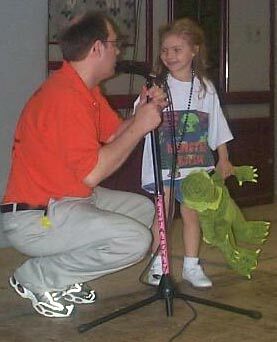 Proud dad and daughter at Monster Bash 2002! 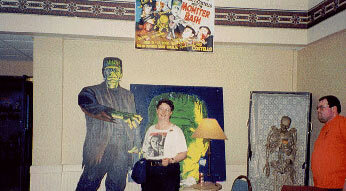 Attendee and Karloff fan Brenda McNeal at Monster Bash 2002! 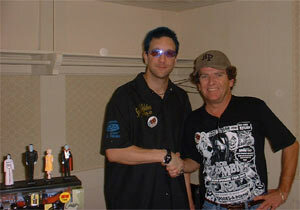 Attendee Brian Wilson and Butch Patrick at Monster Bash 2002! 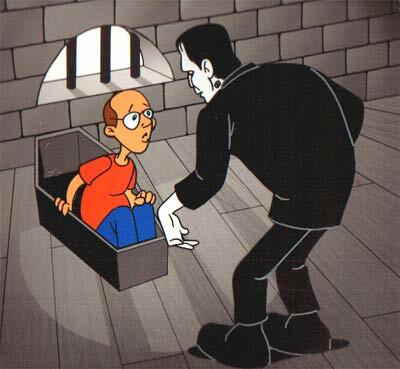 Cell art from a cartoon produced for Bash 2002 by dear friend Joe Busam! PHOTOS courtesy of Barb Heiss, Tom Savini, Cortlandt Hull, Joe Skinnell, Christine Thomas, Karl and Cathy Spisak, Uncle Larry and Kevin...and many others...thank you!